The main shrine at the Temple of Literature. A view of the street from a second floor restaurant. It doesn’t come close to showing the true craziness, though. just GO. Oh, we weren’t reckless or anything, especially with our kids, but we did have to use a certain amount of faith – and even prayer – to get across streets, and sometimes even down them if they circumstances were dire. By the end of the day it became entertaining to see how on earth we were going to get from point A to point B safely. At first the constant honking really bothered our daughter, but then we realized people didn’t use horns to ask people to get out of their way, rather it was the opposite: a gentle honk every few minutes reminded people you were there. The streets, in most areas of the city, were like nothing we had ever experienced, even in all of our travels. The architecture of the city is also amazing. One guide told us that buildings are taxed according to the amount of street space they take up – so they strive to take up as little street space as possible. 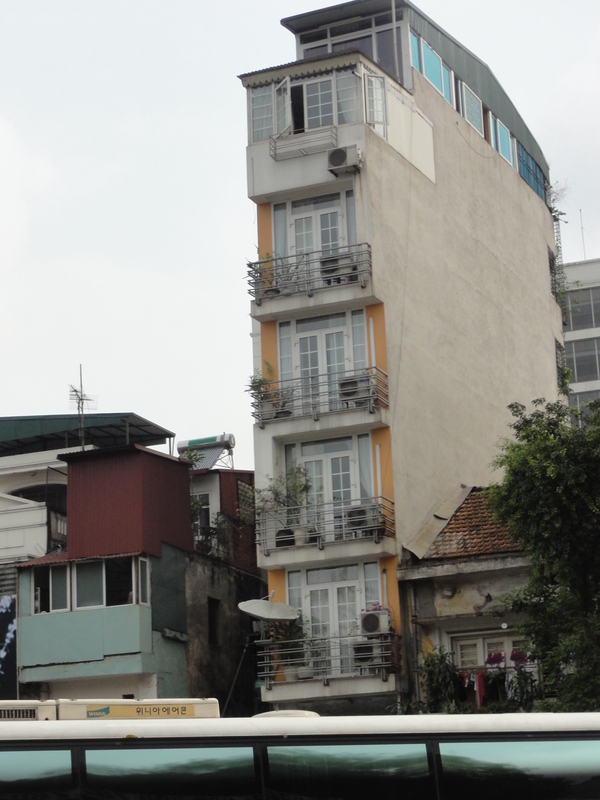 Therefore most buildings are tall – and very skinny. 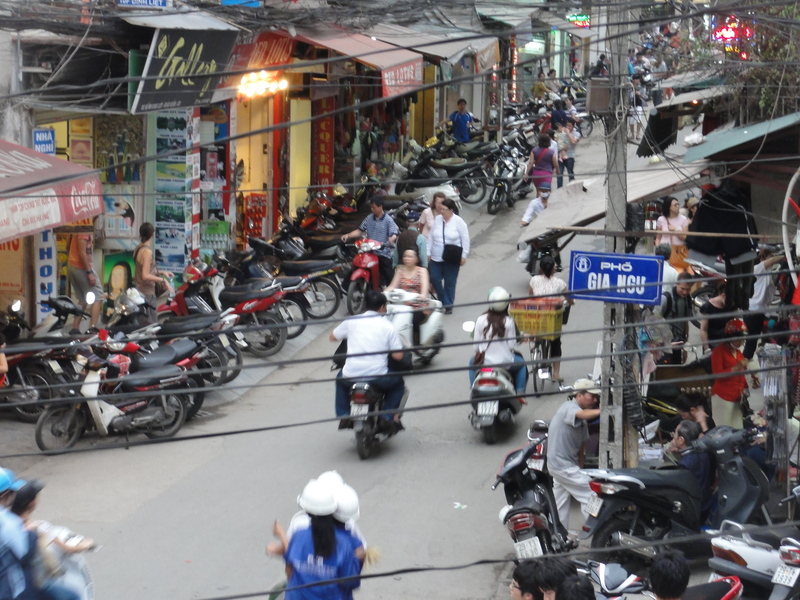 That being said, the city of Hanoi has a lot to recommend it. 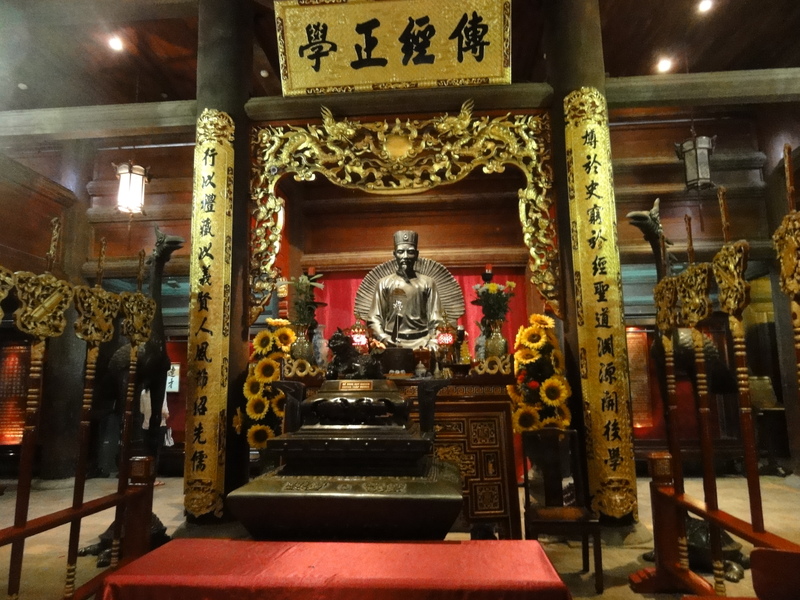 The Temple of Literature, our first stop, was rebuilt from the ancient times when it was home to scholars and priests to study all measures of art, literature, politics and other high ideals. It’s a stunning courtyard of homage to the past and past scholarship that includes UNESCO protected statues. Sometimes I stand awestruck before these religious statues and carvings that are older than the country of my birth. 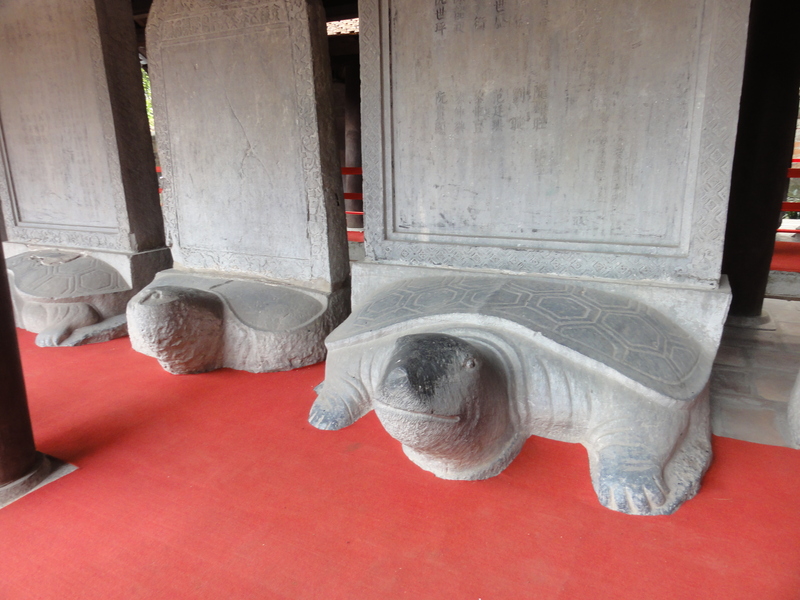 The turtles of learning – a UNESCO protected set of statues. they are no less crazy. All over the city, sidewalks were littered with low-slung Ikea-like, child-sized plastic tables and chairs in front of cafes where people sit and eat lunch, snacks, dinner and drinks. It’s astounding to pick your way through the people as you walk. Typical old meets new scene in the city. foreigners, to buy from them. That bothered both of my kids a lot – they didn’t like turning people – mostly women – down when they asked us to buy from them, and my husband and I might turn our backs if we didn’t want to buy. Of course, we did buy many things and even went through the weekend night market when we were there on the hunt for bargains, of which we found many, including sneakers for my son and a fun handbag for my daughter. And we ATE! The Vietnamese food was simply delicious, and way beyond just the Pho that Americans often think of as Vietnamese. While we did eat the beef noodle soup, there were also many delectable morsels of pork, chicken, and other noodle dishes to be had. We ate duck and spring rolls, and drank fresh fruit juice, like mango and watermelon juice, until we practically floated instead of walked. 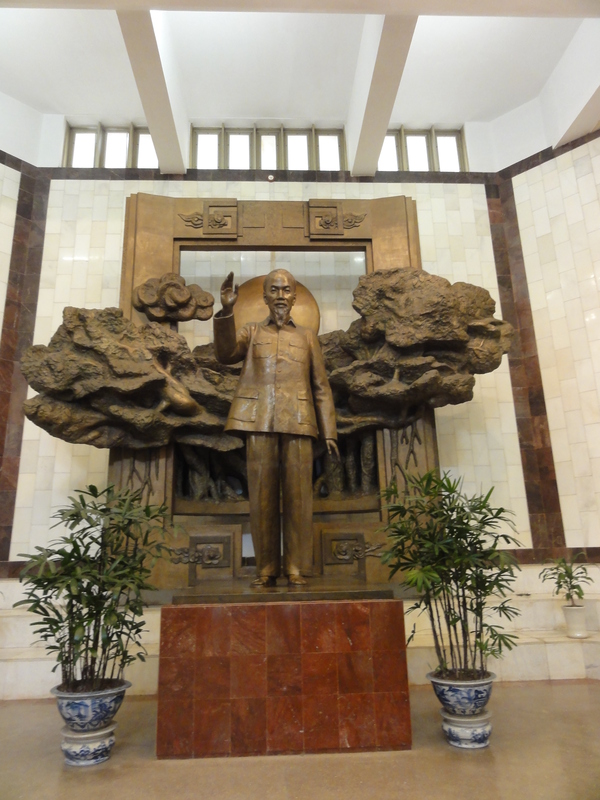 Statue of Ho Chi Minh in the main hall of the museum dedicated to his memory and achievements. boutique hotel with only 20 rooms right in the bustle of the old city. Coming in off the streets with the white marble beckoning like a siren song, felt heavenly. The people were so nice and helpful, and they really did try to please in every way possible. They were the first to introduce us to the thick, rich Vietnamese coffee and we never looked back. Either with or without the condensed milk for lightening and thickening, it is delicious in every rich sense. On our second day in the city we went to Ho Chi Minh’s tomb and museum. I was wearing pretty modest shorts, but they wouldn’t let me in with my knees showing. I had to buy a wrap and put it around my waist in order to go in. Respect. It was all pretty surreal to see a preserved body as well as all of the “information” at the museum. The beautiful and graceful water puppets. 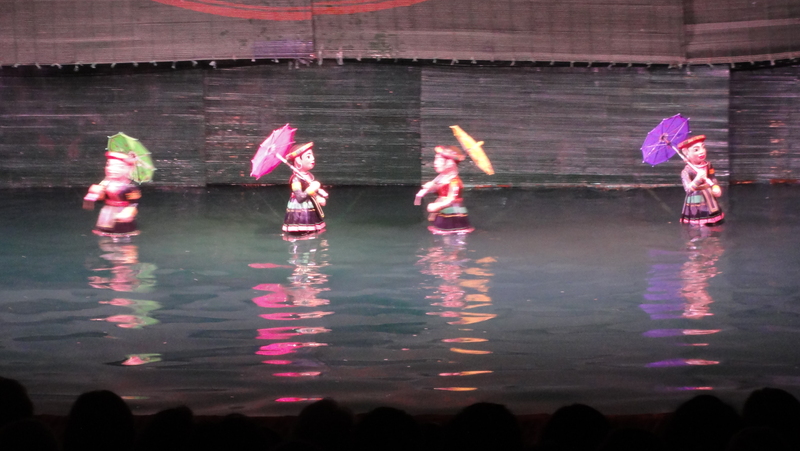 live, traditional music, puppets dance around and through a small pond at the front of the theater, telling traditional Vietnamese stories. It was vibrant and beautiful. 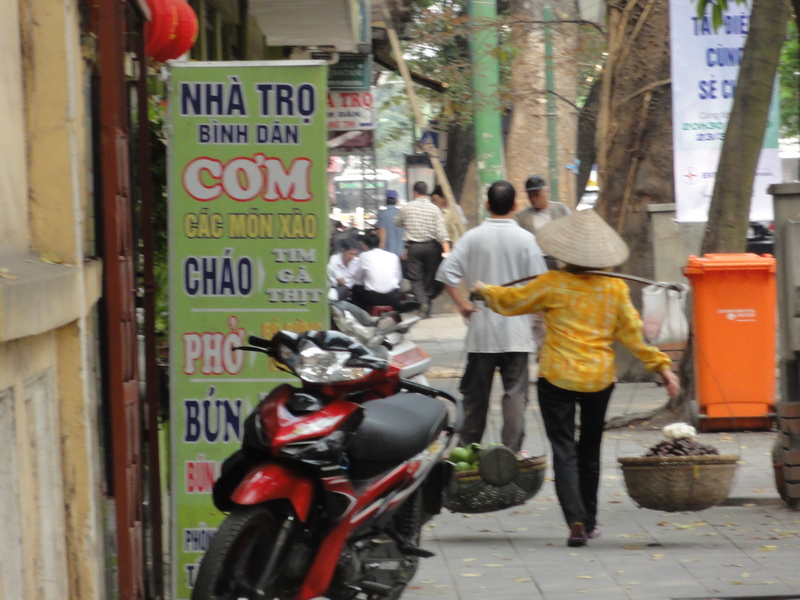 Hanoi is a charming and interesting city if you can get through the pedestrian experience and the interminable grime. I hope to go back there some day.